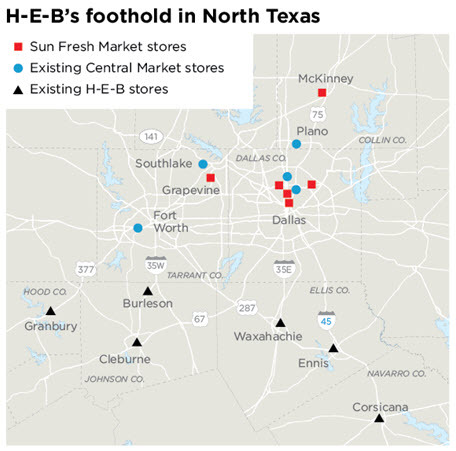 ​DALLAS - San Antonio-based H-E-B/Central Market just made another big leap into the Dallas-Fort Worth market with the purchase of six Sun Fresh Market stores. The state's largest independent grocery chain has purchased four Dallas stores in Uptown, Lake Highlands, Lakewood and Northwest Dallas. Two more stores are in McKinney and Grapevine. McKinney - Hardin Blvd. and El Dorado Pkwy. Grapevine - SH 121 and Hall Johnson Rd. Dallas - McKinney Ave. and Lemmon Ave.
Dallas - Northwest Hwy. and Midway Rd. Dallas - Northwest Hwy. and Ferndale Rd. Dallas - Mockingbird Ln. and Abrams Rd. H-E-B owns about 20 parcels of land in the North Texas region, including in Allen, Carrollton, Corinth, Dallas, DeSoto, Fort Worth, Frisco, Grand Prairie, Mansfield, McKinney, Murphy and Plano. ​Che​ck out Dallas Retail Market Research​!